Americium is a radioactive transuranic chemical element with symbol Am and atomic number 95. This member of the actinide series is located in the periodic table under the lanthanide element europium, and thus by analogy was named after the Americas. 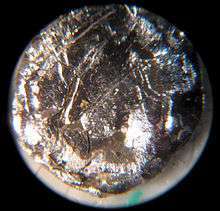 Americium is a relatively soft radioactive metal with silvery appearance. Its common isotopes are 241Am and 243Am. In chemical compounds, americium usually assumes the oxidation state +3, especially in solutions. Several other oxidation states are known, which range from +2 to +8 and can be identified by their characteristic optical absorption spectra. The crystal lattice of solid americium and its compounds contain small instrinsic radiogenic defects, due to metamicitization induced by self-irradiation with alpha particles, which accumulates with time; this can cause a drift of some material properties over time, more noticeable in older samples. The new element was isolated from its oxides in a complex, multi-step process. First plutonium-239 nitrate (239PuNO3) solution was coated on a platinum foil of about 0.5 cm2 area, the solution was evaporated and the residue was converted into plutonium dioxide (PuO2) by annealing. 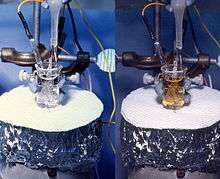 After cyclotron irradiation, the coating was dissolved with nitric acid, and then precipitated as the hydroxide using concentrated aqueous ammonia solution. The residue was dissolved in perchloric acid. Further separation was carried out by ion exchange, yielding a certain isotope of curium. The separation of curium and americium was so painstaking that those elements were initially called by the Berkeley group as pandemonium (from Greek for all demons or hell) and delirium (from Latin for madness). Initial experiments yielded four americium isotopes: 241Am, 242Am, 239Am and 238Am. Americium-241 was directly obtained from plutonium upon absorption of one neutron. It decays by emission of a α-particle to 237Np; the half-life of this decay was first determined as 510 ± 20 years but then corrected to 432.2 years. Existing americium is concentrated in the areas used for the atmospheric nuclear weapons tests conducted between 1945 and 1980, as well as at the sites of nuclear incidents, such as the Chernobyl disaster. 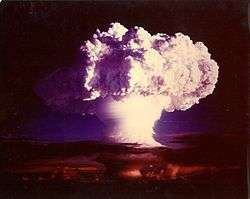 For example, the analysis of the debris at the testing site of the first U.S. hydrogen bomb, Ivy Mike, (1 November 1952, Enewetak Atoll), revealed high concentrations of various actinides including americium; but due to military secrecy, this result was published only until later in 1956. Trinitite, the glassy residue left on the desert floor near Alamogordo, New Mexico, after the plutonium-based Trinity nuclear bomb test on 16 July 1945, contains traces of americium-241. Elevated levels of americium were also detected at the crash site of a US Boeing B-52 bomber aircraft, which carried four hydrogen bombs, in 1968 in Greenland. Most synthesis routines yield a mixture of different actinide isotopes in oxide forms, from which isotopes of americium can be separated. In a typical procedure, the spent reactor fuel (e.g. MOX fuel) is dissolved in nitric acid, and the bulk of uranium and plutonium is removed using a PUREX-type extraction (Plutonium –URanium EXtraction) with tributyl phosphate in a hydrocarbon. The lanthanides and remaining actinides are then separated from the aqueous residue (raffinate) by a diamide-based extraction, to give, after stripping, a mixture of trivalent actinides and lanthanides. Americium compounds are then selectively extracted using multi-step chromatographic and centrifugation techniques with an appropriate reagent. A large amount of work has been done on the solvent extraction of americium. For example, a 2003 EU-funded project codenamed "EUROPART" studied triazines and other compounds as potential extraction agents. A bis-triazinyl bipyridine complex was proposed in 2009 as such a reagent is highly selective to americium (and curium). Separation of americium from the highly similar curium can be achieved by treating a slurry of their hydroxides in aqueous sodium bicarbonate with ozone, at elevated temperatures. Both Am and Cm are mostly present in solutions in the +3 valence state; whereas curium remains unchanged, americium oxidizes to soluble Am(IV) complexes which can be washed away. At ambient conditions, americium is present in its most stable α form which has a hexagonal crystal symmetry, and a space group P63/mmc with lattice parameters a = 346.8 pm and c = 1124 pm, and four atoms per unit cell. 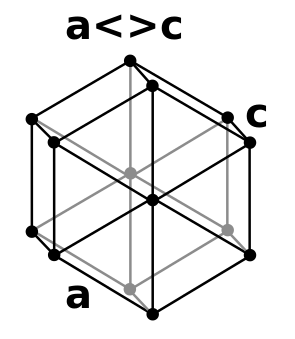 The crystal consists of a double-hexagonal close packing with the layer sequence ABAC and so is isotypic with α-lanthanum and several actinides such as α-curium. The crystal structure of americium changes with pressure and temperature. When compressed at room temperature to 5 GPa, α-Am transforms to the β modification, which has a face-centered cubic (fcc) symmetry, space group Fm3m and lattice constant a = 489 pm. This fcc structure is equivalent to the closest packing with the sequence ABC. Upon further compression to 23 GPa, americium transforms to an orthorhombic γ-Am structure similar to that of α-uranium. There are no further transitions observed up to 52 GPa, except for an appearance of a monoclinic phase at pressures between 10 and 15 GPa. There is no consistency on the status of this phase in the literature, which also sometimes lists the α, β and γ phases as I, II and III. The β-γ transition is accompanied by a 6% decrease in the crystal volume; although theory also predicts a significant volume change for the α-β transition, it is not observed experimentally. The pressure of the α-β transition decreases with increasing temperature, and when α-americium is heated at ambient pressure, at 770 °C it changes into an fcc phase which is different from β-Am, and at 1075 °C it converts to a body-centered cubic structure. The pressure-temperature phase diagram of americium is thus rather similar to those of lanthanum, praseodymium and neodymium. As with many other actinides, self-damage of the crystal lattice due to alpha-particle irradiation is intrinsic to americium. It is especially noticeable at low temperatures, where the mobility of the produced lattice defects is relatively low, by broadening of X-ray diffraction peaks. This effect makes somewhat uncertain the temperature of americium and some of its properties, such as electrical resistivity. So for americium-241, the resistivity at 4.2 K increases with time from about 2 µOhm·cm to 10 µOhm·cm after 40 hours, and saturates at about 16 µOhm·cm after 140 hours. This effect is less pronounced at room temperature, due to annihilation of radiation defects; also heating to room temperature the sample which was kept for hours at low temperatures restores its resistivity. In fresh samples, the resistivity gradually increases with temperature from about 2 µOhm·cm at liquid helium to 69 µOhm·cm at room temperature; this behavior is similar to that of neptunium, uranium, thorium and protactinium, but is different from plutonium and curium which show a rapid rise up to 60 K followed by saturation. The room temperature value for americium is lower than that of neptunium, plutonium and curium, but higher than for uranium, thorium and protactinium. Americium is paramagnetic in a wide temperature range, from that of liquid helium, to room temperature and above. This behavior is markedly different from that of its neighbor curium which exhibits antiferromagnetic transition at 52 K. The thermal expansion coefficient of americium is slightly anisotropic and amounts to (7.5 ± 0.2)×10−6/°C along the shorter a axis and (6.2 ± 0.4)×10−6/°C for the longer c hexagonal axis. The enthalpy of dissolution of americium metal in hydrochloric acid at standard conditions is −620.6 ± 1.3 kJ/mol, from which the standard enthalpy change of formation (ΔfH°) of aqueous Am3+ ion is −621.2 ± 2.0 kJ/mol−1. The standard potential Am3+/Am0 is −2.08 ± 0.01 V.
Another known form of solid tetravalent americium chloride is KAmF5. Tetravalent americium has also been observed in the aqueous phase. For this purpose, black Am(OH)4 was dissolved in 15-M NH3F with the americium concentration of 0.01 M. The resulting reddish solution had a characteristic optical absorption spectrum which is similar to that of AmF4 but differed from other oxidation states of americium. Heating the Am(IV) solution to 90 °C did not result in its disproportionation or reduction, however a slow reduction was observed to Am(III) and assigned to self-irradiation of americium by alpha particles. Analogous to uranocene, americium forms the organometallic compound amerocene with two cyclooctatetraene ligands, with the chemical formula (η8-C8H8)2Am. 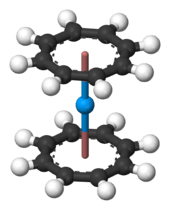 It also makes the trigonal tricyclopentadienylamericium [(η5-C5H5)3Am)] complex with three cyclopentadienyl rings surrounding one atom of americium. About 19 isotopes and 8 nuclear isomers are known for americium. There are two long-lived alpha-emitters, 241Am and 243Am with half-lives of 432.2 and 7,370 years, respectively, and the nuclear isomer 242m1Am has a long half-life of 141 years. The half-lives of other isotopes and isomers range from 0.64 microseconds for 245m1Am to 50.8 hours for 240Am. As with most other actinides, the isotopes of americium with odd number of neutrons have relatively high rate of nuclear fission and low critical mass. Nearly all (99.541%) of 242m1Am decays by internal conversion to 242Am and the remaining 0.459% by α-decay to 238Np. The latter breaks down to 238Pu and then to 234U. Americium is the only synthetic element to have found its way into the household, where the most common type of smoke detector uses 241Am in the form of americium dioxide as its source of ionizing radiation. This isotope is preferred over 226Ra because it emits 5 times more alpha particles and relatively little harmful gamma radiation. Element collector Theodore Gray mentions in his book The Elements: A Visual Exploration of Every Known Atom in the Universe "You might think that a synthetic radioactive element that follows plutonium (94)—and has a significantly shorter half-life—would be some kind of superbomb material, available only to scientists in secret laboratories. Perhaps a mad scientist is studying americium in a lair somewhere, but if you want some yourself you can simply walk into any neighborhood hardware store, supermarket, or Wal-Mart and buy some, no questions asked." He also adds "The reason is not that americium is fundamentally less dangerous than the elements around it. In fact, the commonly available isotope, 241Am, is significantly more radioactive than weapons-grade plutonium, and at least as toxic. No, the difference is simply that there is a useful application for americium that requires only a very tiny amount, and for which a company was prepared to go through the effort required to carve out and get a regulatory exception." 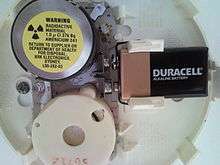 The amount of americium in a typical new smoke detector is 1 microcurie (37 kBq) or 0.29 microgram. This amount declines slowly as the americium decays into neptunium-237, a different transuranic element with a much longer half-life (about 2.14 million years). With its half-life of 432.2 years, the americium in a smoke detector includes about 3% neptunium after 19 years, and about 5% after 32 years. The radiation passes through an ionization chamber, an air-filled space between two electrodes, and permits a small, constant current between the electrodes. Any smoke that enters the chamber absorbs the alpha particles, which reduces the ionization and affects this current, triggering the alarm. Compared to the alternative optical smoke detector, the ionization smoke detector is cheaper and can detect particles which are too small to produce significant light scattering; however, it is more prone to false alarms. Another proposed space-related application of americium is a fuel for space ships with nuclear propulsion. It relies on the very high rate of nuclear fission of 242mAm, which can be maintained even in a micrometer-thick foil. Small thickness avoids the problem of self-absorption of emitted radiation. This problem is pertinent to uranium or plutonium rods, in which only surface layers provide alpha-particles. 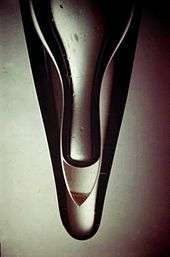 The fission products of 242mAm can either directly propel the spaceship or they can heat up a thrusting gas; they can also transfer their energy to a fluid and generate electricity through a magnetohydrodynamic generator. ↑ The "metastable" state is marked by the letter m.
1 2 3 Muller, W.; Schenkel, R.; Schmidt, H. E.; Spirlet, J. C.; McElroy, D. L.; Hall, R. O. A.; Mortimer, M. J. (1978). "The electrical resistivity and specific heat of americium metal". Journal of Low Temperature Physics. 30 (5–6): 561. Bibcode:1978JLTP...30..561M. doi:10.1007/BF00116197. ↑ "Demobilized Physics". LBL NEWS Magazine. 6 (3): 49. Fall 1981. ↑ Street, K.; Ghiorso, A.; Seaborg, G. (1950). 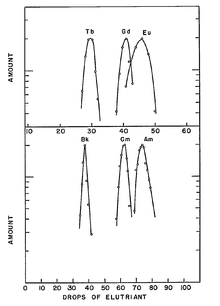 "The Isotopes of Americium". Physical Review. 79 (3): 530. Bibcode:1950PhRv...79..530S. doi:10.1103/PhysRev.79.530. 1 2 Pepling, Rachel Sheremeta (2003). "Chemical & Engineering News: It's Elemental: The Periodic Table – Americium". Retrieved 7 July 2010. ↑ Robert E. Krebs (2006). The History and Use of Our Earth's Chemical Elements: A Reference Guide (Second ed.). Greenwood Publishing Group. p. 322. ISBN 978-0-313-33438-2. 1 2 3 4 5 Audi, G; Bersillon, O.; Blachot, J.; Wapstra, A.H. (1997). "The N? evaluation of nuclear and decay properties" (PDF). Nuclear Physics A. 624: 1. Bibcode:1997NuPhA.624....1A. doi:10.1016/S0375-9474(97)00482-X. 1 2 Westrum, Edgar F.; Eyring, Leroy (1951). "The Preparation and Some Properties of Americium Metal". Journal of the American Chemical Society. 73 (7): 3396. doi:10.1021/ja01151a116. ↑ Eriksson, Mats (April 2002). On Weapons Plutonium in the Arctic Environment (PDF). Risø National Laboratory, Roskilde, Denmark: Lund University. p. 28. Archived (PDF) from the original on 18 December 2008. Retrieved 15 November 2008. ↑ Hammond C. R. "The elements" in Lide, D. R., ed. (2005). CRC Handbook of Chemistry and Physics (86th ed.). Boca Raton (FL): CRC Press. ISBN 0-8493-0486-5. ↑ Emeleus, H. J.; Sharpe, A. G. (1987). Advances in Inorganic Chemistry. Academic Press. p. 2. ISBN 978-0-08-057880-4. ↑ Hudson, M. J.; et al. (2003). "The coordination chemistry of 1,2,4-triazinyl bipyridines with lanthanide(III) elements – implications for the partitioning of americium(III)". Dalton Trans. (9): 1675–1685. doi:10.1039/b301178j. ↑ Geist, A.; et al. (11–13 December 2000). "Actinide(III)/Lanthanide(III) Partitioning Using n-Pr-BTP as Extractant: Extraction Kinetics and Extraction Test in a Hollow Fiber Module" (PDF). 6th Information Exchange Meeting on Actinide and Fission Product Partitioning and Transmutation. OECD Nuclear Energy Agency. ↑ Hill, C.; Guillaneux, D.; Hérès, X.; Boubals, N. & Ramain, L. (24–26 October 2000). "Sanex-BTP Process Development Studies" (PDF). Atalante 2000: Scientific Research on the Back-end of the Fuel Cycle for the 21st Century. Commissariat à l'énergie atomique. ↑ Geist, A.; et al. (14–16 October 2002). "Effective Actinide(III)-Lanthanide(III) Separation in Miniature Hollow Fibre Modules" (PDF). 7th Information Exchange Meeting on Actinide and Fission Product Partitioning and Transmutation. OECD Nuclear Energy Agency. ↑ Ensor, D.D. "Separation Studies of f-Elements" (PDF). Tennessee Tech University. 1 2 3 Gmelin Handbook of Inorganic Chemistry, System No. 71, transuranics, Part B 1, pp. 57–67. 1 2 3 Wade, W; Wolf, T. (1967). "Preparation and some properties of americium metal". Journal of Inorganic and Nuclear Chemistry. 29 (10): 2577. doi:10.1016/0022-1902(67)80183-0. 1 2 Benedict, U (1984). "Study of actinide metals and actinide compounds under high pressures". Journal of the Less Common Metals. 100: 153. doi:10.1016/0022-5088(84)90061-4. 1 2 3 4 McWhan, D.B. ; Cunningham, B.B. ; Wallmann, J.C. (1962). "Crystal structure, thermal expansion and melting point of americium metal". Journal of Inorganic and Nuclear Chemistry. 24 (9): 1025. doi:10.1016/0022-1902(62)80246-2. ↑ Young, D. A. (1991). Phase diagrams of the elements. University of California Press. p. 226. ISBN 978-0-520-91148-2. ↑ Benedict, U; Dufour, C (1980). "Low temperature lattice expansion of americium dioxide". Physica B+C. 102: 303. Bibcode:1980PhyBC.102..303B. doi:10.1016/0378-4363(80)90178-3. ↑ Mondal, J.U. ; Raschella, D.L. ; Haire, R.G. ; Petereson, J.R. (1987). "The enthalpy of solution of 243Am metal and the standard enthalpy of formation of Am3+(aq)". Thermochimica Acta. 116: 235. doi:10.1016/0040-6031(87)88183-2. 1 2 Asprey, L. B.; Penneman, R. A. (1961). "FIRST OBSERVATION OF AQUEOUS TETRAVALENT AMERICIUM". Journal of the American Chemical Society. 83 (9): 2200. doi:10.1021/ja01470a040. 1 2 Coleman, J. S.; Keenan, T. K.; Jones, L. H.; Carnall, W. T.; Penneman, R. A. (1963). "Preparation and Properties of Americium(VI) in Aqueous Carbonate Solutions". Inorganic Chemistry. 2: 58. doi:10.1021/ic50005a017. 1 2 Asprey, L. B.; Stephanou, S. E.; Penneman, R. A. (1951). "Hexavalent Americium". Journal of the American Chemical Society. 73 (12): 5715. doi:10.1021/ja01156a065. ↑ Asprey, L. B.; Stephanou, S. E.; Penneman, R. A. (1950). "A NEW VALENCE STATE OF AMERICIUM, AM(VI)". Journal of the American Chemical Society. 72 (3): 1425. doi:10.1021/ja01159a528. ↑ Werner, L. B.; Perlman, I. (1951). "The Pentavalent State of Americium". Journal of the American Chemical Society. 73: 495. doi:10.1021/ja01145a540. ↑ Hall, G; Markin, T.L. (1957). "The self-reduction of americium(V) and (VI) and the disproportionation of americium(V) in aqueous solution". Journal of Inorganic and Nuclear Chemistry. 4 (5–6): 296. doi:10.1016/0022-1902(57)80011-6. ↑ Coleman, James S. (1963). "The Kinetics of the Disproportionation of Americium(V)". Inorganic Chemistry. 2: 53. doi:10.1021/ic50005a016. ↑ Akimoto, Y. (1967). "A note on AmN and AmO". Journal of Inorganic and Nuclear Chemistry. 29 (10): 2650. doi:10.1016/0022-1902(67)80191-X. 1 2 Asprey, L. B.; Keenan, T. K.; Kruse, F. H. (1965). "Crystal Structures of the Trifluorides, Trichlorides, Tribromides, and Triiodides of Americium and Curium". Inorganic Chemistry. 4 (7): 985. doi:10.1021/ic50029a013. ↑ Baybarz, R.D. (1973). "The preparation and crystal structures of americium dichloride and dibromide". Journal of Inorganic and Nuclear Chemistry. 35 (2): 483. doi:10.1016/0022-1902(73)80560-3. 1 2 Asprey, L. B. (1954). "New Compounds of Quadrivalent Americium, AmF4, KAmF5". Journal of the American Chemical Society. 76 (7): 2019. doi:10.1021/ja01636a094. ↑ Burns, John H.; Peterson, Joseph Richard (1971). "Crystal structures of americium trichloride hexahydrate and berkelium trichloride hexahydrate". Inorganic Chemistry. 10: 147. doi:10.1021/ic50095a029. 1 2 Damien, D; Jove, J (1971). "Americium disulfide and diselenide". Inorganic and Nuclear Chemistry Letters. 7 (7): 685. doi:10.1016/0020-1650(71)80055-7. 1 2 Roddy, J (1974). "Americium metallides: AmAs, AmSb, AmBi, Am3Se4, and AmSe2". Journal of Inorganic and Nuclear Chemistry. 36 (11): 2531. doi:10.1016/0022-1902(74)80466-5. ↑ Damien, D (1972). "Americium tritelluride and ditelluride". Inorganic and Nuclear Chemistry Letters. 8 (5): 501. doi:10.1016/0020-1650(72)80262-9. ↑ Charvillat, J; Damien, D. (1973). "Americium monoarsenide". Inorganic and Nuclear Chemistry Letters. 9 (5): 559. doi:10.1016/0020-1650(73)80191-6. ↑ Weigel, F; Wittmann, F; Marquart, R (1977). "Americium monosilicide and "disilicide"". Journal of the Less Common Metals. 56: 47. doi:10.1016/0022-5088(77)90217-X. ↑ Eick, Harry A.; Mulford, R.N.R. (1969). "Americium and neptunium borides". Journal of Inorganic and Nuclear Chemistry. 31 (2): 371. doi:10.1016/0022-1902(69)80480-X. ↑ Elschenbroich, Christoph (2008). Organometallchemie. Vieweg+teubner Verlag. p. 589. ISBN 978-3-8351-0167-8. ↑ Albrecht-Schmitt, Thomas E. (2008). Organometallic and Coordination Chemistry of the Actinides. Springer. p. 8. ISBN 978-3-540-77836-3. ↑ Dodge, C.J. ; et al. (1998). "Role of Microbes as Biocolloids in the Transport of Actinides from a Deep Underground Radioactive Waste Repository". Radiochim. Acta. 82: 347–354. ↑ MacAskie, LE; Jeong, BC; Tolley, MR (1994). "Enzymically accelerated biomineralization of heavy metals: application to the removal of americium and plutonium from aqueous flows". FEMS Microbiology Reviews. 14 (4): 351–67. doi:10.1111/j.1574-6976.1994.tb00109.x. PMID 7917422. ↑ Wurtz, EA; Sibley, TH; Schell, WR (1986). "Interactions of Escherichia coli and marine bacteria with 241Am in laboratory cultures". Health physics. 50 (1): 79–88. doi:10.1097/00004032-198601000-00007. PMID 3511007. ↑ Francis, A.J. ; et al. (1998). "Role of Bacteria as Biocolloids in the Transport of Actinides from a Deep Underground Radioactive Waste Repository". Acta Radiochimica. 82: 347–354. OSTI 2439. ↑ Liu, N; Yang, Y; Luo, S; Zhang, T; Jin, J; Liao, J; Hua, X (2002). "Biosorption of 241Am by Rhizopus arrihizus: preliminary investigation and evaluation". Applied Radiation and Isotopes. 57 (2): 139–43. doi:10.1016/s0969-8043(02)00076-3. PMID 12150270. ↑ Pfennig, G.; Klewe-Nebenius, H and Seelmann Eggebert, W. (Eds. ): Karlsruhe nuclide, 7 Edition 2006. ↑ Institut de Radioprotection et de Sûreté Nucléaire, "Evaluation of nuclear criticality safety data and limits for actinides in transport", p. 16. ↑ Ronen, Y.; Aboudy, M. & Regev, D. (2000). "A novel method for energy production using 242mAm as a nuclear fuel". Nuclear technology. 129 (3): 407–417. ↑ Ronen, Y.; Aboudy, M. & Regev, D. (2001). "Homogeneous 242mAm-Fueled Reactor for Neutron Capture Therapy". Nuclear Science and Engineering. 138 (3): 295–304. OSTI 20804726. ↑ Klinck, Christian. "α-decay of 241Am. Theory – A lecture course on radioactivity". University of Technology Kaiserslautern. Retrieved 28 November 2010. ↑ The Elements: A Visual Exploration of Every Known Atom in the Universe. Hachette Books. 3 April 2012. pp. 220–. ISBN 978-1-57912-895-1. 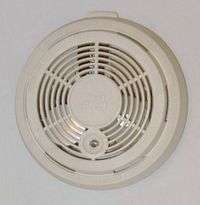 ↑ "Smoke detectors and americium-241 fact sheet" (PDF). Canadian Nuclear Society. Retrieved 31 August 2009. ↑ Gerberding, Julie Louise (2004). "Toxicological Profile For Americium" (PDF; 2.1 MB). United States Department of Health and Human Services/Agency for Toxic Substances and Disease Registry. Archived (PDF) from the original on 6 September 2009. Retrieved 29 August 2009. ↑ "Extremely Efficient Nuclear Fuel Could Take Man To Mars In Just Two Weeks". ScienceDaily. 3 January 2001. Archived from the original on 17 October 2007. Retrieved 22 November 2007. ↑ Kammash, T.; et al. (10 January 1993). "An americium-fueled gas core nuclear rocket". AIP Conf. Proc. Tenth symposium on space nuclear power and propulsion. 271. pp. 585–589. doi:10.1063/1.43073. 1 2 Ronen, Y; Shwageraus, E (2000). "Ultra-thin 242mAm fuel elements in nuclear reactors". 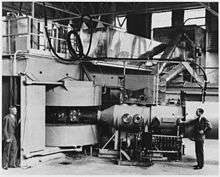 Nuclear Instruments and Methods in Physics Research Section A: Accelerators, Spectrometers, Detectors and Associated Equipment. 455 (2): 442. Bibcode:2000NIMPA.455..442R. doi:10.1016/S0168-9002(00)00506-4. 1 2 Binder, Harry H. (1999). Lexikon der chemischen Elemente: das Periodensystem in Fakten, Zahlen und Daten : mit 96 Abbildungen und vielen tabellarischen Zusammenstellungen. ISBN 978-3-7776-0736-8. ↑ Division of Environmental Health, Office of Radiation Protection (November 2002). "Fact Sheet # 23. Americium-241" (PDF). Archived (PDF) from the original on 11 November 2010. Retrieved 28 November 2010. ↑ "'Radioactive Boy Scout' Charged in Smoke Detector Theft". Fox News. 4 August 2007. Archived from the original on 8 December 2007. Retrieved 28 November 2007. ↑ "Man dubbed 'Radioactive Boy Scout' pleads guilty". Detroit Free Press. Associated Press. 27 August 2007. Archived from the original on 29 September 2007. Retrieved 27 August 2007. ↑ "'Radioactive Boy Scout' Sentenced to 90 Days for Stealing Smoke Detectors". Fox News. 4 October 2007. Archived from the original on 13 November 2007. Retrieved 28 November 2007. ↑ Cary, Annette (25 April 2008). "Doctor remembers Hanford's 'Atomic Man'". Tri-City Herald. Archived from the original on 10 February 2010. Retrieved 17 June 2008. ↑ AP wire (3 June 2005). "Hanford nuclear workers enter site of worst contamination accident". Archived from the original on 13 June 2005. Retrieved 17 June 2007. Fioni, Gabriele; Cribier, Michel & Marie, Frédéric. "Can the minor actinide, americium-241, be transmuted by thermal neutrons?". Commissariat à l'énergie atomique.